Last week, news from Beijing mentioned Malaysia as the regional electric vehicle manufacturing hub for Chinese carmaker Beijing Auto International Corporation (BAIC). Now, further details have emerged, with the plant in Gurun, Kedah, expected to be operational in July 2016 with an initial investment of up to RM300 million, Bernama reports. Amber Dual Sdn Bhd is the JV’s local partner, and its managing director Shabudin Md Saman said the project has got off the ground in Gurun. 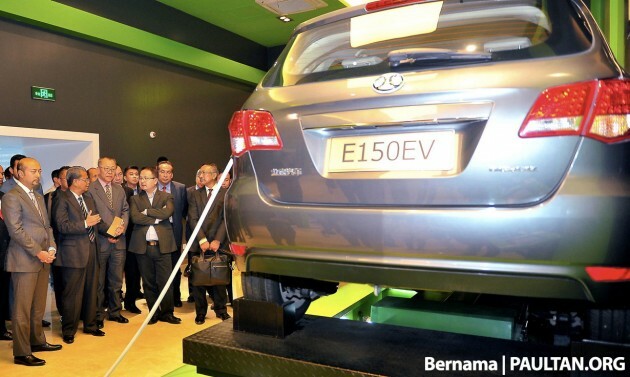 The bulk of R&D work is mainly to change the left-hand drive system to right-hand drive at the cost of about RM50 million. Prototypes are expected to be ready in December, with production expected to start in July next year. BAIC’s Gurun plant, which is being built at the cost of between RM200 million and RM300 million, will also serve as a marketing centre for BAIC vehicles for both the Malaysian market and the ASEAN region. BAIC is targeting production of between 2,000 and 3,000 EVs next year, with a gradual yearly increase. “Our company has also set our mind on a higher goal as we do not want to rely solely on BAIC technology, instead we aim at adding value in the vehicle design. We aspire to lead Malaysia’s electric vehicle technology. Government help is also needed as electric vehicle technology requires high financing, especially in installing vehicle battery-charging facilities,” Shabudin said. “We are also working on battery technology on our own. For an electric vehicle, the battery alone accounts for one-third of its cost,” he added. Kedah chief minister Datuk Seri Mukhriz Tun Dr Mahathir, who was in Beijing to witness the signing of the deal between BAIC and Amber Dual last week, is hoping for spin-offs. “With the plant in Gurun, it will contribute to the growth of Kedah’s economy. As electric vehicles are the latest technology, we expect that there will be suppliers who will enter the electric vehicle business,” he said. Hahahaha PR Troopers will keep complaining because they will not accept BN are the best and successful Govt in the world !!! We love Rakyat, Rakyat love Najib ! Others just follow or shut up !!! the rear actually reminds me of the mercedes b170. Kedah has become one of the top vehicle producing states in Malaysia today, despite being one of Malaysia’s poorest states by Per Capita income. Yet, Kedah did not have vehicle plants just a two or three decades back. The entire automotive industry in Kedah is built upon government support and incentives for the ‘Northern Economic Corridor’. Arguably, Industri Otomotif Komersial (Malaysia) Sdn. Bhd. (better known as Inokom) was the company that established and jump-started Kedah’s automotive industry in the late 90s. Inokom makes rebadged Hyundai cars, and also assembles Mazda, Ford, Land Rover, BMW, Mini, Foton and Jinbei vehicles today. There’s also the Naza plant in nearby Gurun, which assembles Peugeots and Kias, and the new Great Wall plant which hasn’t taken off yet. During the 90s, Selangor, Kuala Lumpur, Pahang and Johor had the lion’s share of Malaysia’s vehicle factories. Today, Johor’s automotive industry (which was led by Oriental Assemblers Sdn. Bhd. (OASB)) has crumbled, ever since Honda built their own Malaysian plant in Melaka and Hyundai shifted assembly to Inokom’s plant. Selangor’s automotive industry has gone from strength to strength, now with Perodua’s second plant (where the Axia is made) and the continued growth of Tan Chong Motor Assemblies (TCMA) Serendah plant (opposite Perodua’s factories) and UMW Toyota Motor’s (UMWTM) Shah Alam plant, Assembly Services Sdn. Bhd. (ASSB). No new plants have been built in KL, TCMA’s Segambut plant is the only one of its kind in KL. DRB-HICOM’s unified assembly plants in the small city of Pekan in Pahang has seen ups (addition of Mercedes-Benz and VW assembly lines) and downs (loss of USPD’s assembly of Proton cars), but in time they will grow too. Melaka never had a car factory prior to Honda Malaysia’s plant which was constructed in the early 2000s. The Honda plant in Melaka has definitely helped Honda Malaysia claim the title of no.1 non-national car brand by sales volume in Malaysia (previously held my UMW Toyota Motor). Perak has only one plant too, that is Proton’s Tanjung Malim plant, built in the early 2000s. Penang, Negeri Sembilan, Sabah and Sarawak also have a few small vehicle plants. Just sharing some info about our automotive industry. Many Malaysians think that our auto industry is just Proton, Perodua, Naza and Inokom, but that’s not true. All the non-Malaysian car companies have invested millions if not billions of ringgit in our industry over the years. They have helped employ thousands of Malaysians and boosted our Gross Domestic Product, Per Capita income and quality of living. So please, don’t laugh at all these China car companies, one day, they will be an invaluable asset to our automotive industry. too long to read. skip. … Thank you for your feedback. I have conciseness problems. If only it benefits the people outside of the automotive industry as well by helping make cars damn well more affordable. 9 years loans should be reserved for education or houses. At least, those things last longer than the loan duration. without reading the Article well, i thought i saw Mercedes launching new B class. Who know, imitate product again from great wall china. Why china cant sack off ages of copy and paste since their tech are so high mow? And dont forget to check out the interior as well. Its almost identical with the Merc B170. Lol..
No worries, when BAIC JV with local companies make/assemble cars out of China for ASEAN regions and Malaysia, I guess that IP and copyright has been taken care off to avoid legal issues, silly to waste huge investment. I take that BAIC EV be will release next year and I hope you know you’re against local Proton EV still in incubating stage (battery type not decided and milage). Maybe you can take the cue from Proton EV intention for Indonesia and replace with BAIC EV.